Priesthood keys are the power and authority to direct the Lord’s work on the earth. The Lord has sent holy messengers from His presence to restore the keys of the priesthood. We believe that following a long night of darkness, unbelief, and departure from the truths of pure and perfect Christianity, the Lord in his infinite wisdom has again restored to earth the fullness of the everlasting gospel. When Peter, James, and John conferred the Melchizedek Priesthood on Joseph Smith and Oliver Cowdery, they also bestowed priesthood keys. After the organization of the Church the Lord commanded His Saints that they build a house unto His name. The Saints hardly realized the importance of it, and they did not go to work at once to build that house, so the Lord rebuked them [see D&C 95:1–4]. After the rebuke they went to with their might and in their poverty built the Kirtland Temple. What was it built for? As a holy sanctuary where Jesus Christ could come, where He could send His servants, the prophets, with their keys of authority. … We know that three of the great prophets of old who held important keys did come upon the 3rd day of April in the year 1836. Elias came after Moses had conferred his keys and brought the gospel of the dispensation in which Abraham lived [see D&C 110:12]. Everything that pertains to that dispensation, the blessings that were conferred upon Abraham, the promises that were given to his posterity, all had to be restored, and Elias, who held the keys of that dispensation, came. 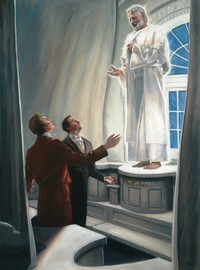 In the Kirtland Temple, Elijah appeared to Joseph Smith and Oliver Cowdery and bestowed the keys of sealing. The President of the Church holds the keys over all the Church. We should honor those to whom the President of the Church has delegated keys of authority. The united voice of those who hold the keys of the kingdom will always guide us where the Lord wants us to be. I think there is one thing which we should have exceedingly clear in our minds. Neither the President of the Church, nor the First Presidency, nor the united voice of the First Presidency and the Twelve will ever lead the Saints astray or send forth counsel to the world that is contrary to the mind and will of the Lord. How does section 1 help you understand the difference between holding an office in the priesthood and holding priesthood keys? Why do you think this is an important distinction? How do you think the Church is strengthened by the organization described in sections 3 and 4? How are individual Church members strengthened? “There may … be times when you do not know the answer to a question. If this happens, simply say that you do not know. You may want to say that you will try to find the answer. Or you may want to invite learners to find the answer, giving them time in another lesson to report on what they have learned” (Teaching, No Greater Call , 64). In Conference Report, Apr. 1951, 58. Answers to Gospel Questions, comp. Joseph Fielding Smith Jr., 5 vols. (1957–66), 2:40. In Francis M. Gibbons, Joseph Fielding Smith: Gospel Scholar, Prophet of God (1992), 342. N. Eldon Tanner, “A Man without Guile,” Ensign, Aug. 1972, 33. “Principles of the Gospel: The New and Everlasting Covenant,” Deseret News, May 6, 1939, Church section, 5; see also Doctrines of Salvation, ed. Bruce R. McConkie, 3 vols. (1954–56), 3:136–37. In Conference Report, Apr. 1967, 98. “Eternal Keys and the Right to Preside,” Ensign, July 1972, 87. In Conference Report, Apr. 1967, 99. “Out of the Darkness,” Ensign, June 1971, 4. “The Coming of Elijah,” Ensign, Jan. 1972, 5. “The Keys of the Priesthood Restored,” Utah Genealogical and Historical Magazine, July 1936, 98–99. “The Keys of the Priesthood Restored,” 101. “The Keys of the Priesthood Restored,” 99–100. In Conference Report, Apr. 1970, 58. In Conference Report, Apr. 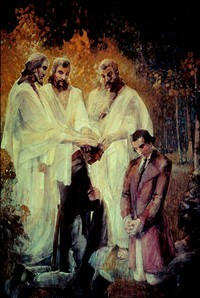 1948, 135; see also Doctrines of Salvation, 3:129. “Eternal Keys and the Right to Preside,” 87–88. “Eternal Keys and the Right to Preside,” 87. “Priesthood—Restoration of Keys,” Deseret News, Sept. 16, 1933; Church section, 4; see also Doctrines of Salvation, 3:135. “The Keys of the Priesthood Restored,” 101; see also Doctrines of Salvation, 3:135. Elijah the Prophet and His Mission and Salvation Universal (1957), 50; see also Doctrines of Salvation, 3:136. In Conference Report, Apr. 1967, 98–99. Answers to Gospel Questions, 2:40–41. “Eternal Keys and the Right to Preside,” 88.